ADDRESS: 1817 High Ct., FL 32304. Off of High Road between Tharpe and Tennessee Street on the west side of High Road closer to Tharpe. This is a quiet loop street and a small neighborhood. 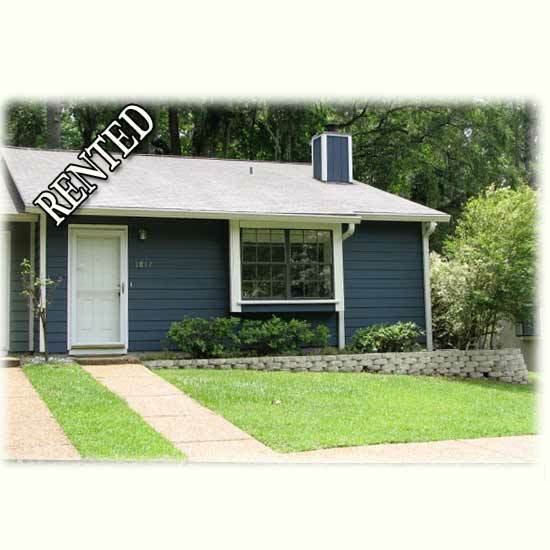 UTILITIES: Tenant pays for all Utilities: City of Tallahassee, Cable TV, Internet, Telephone, Garbage, etc. Property Manager changes Air Conditioning Filters Monthly. LAWN CARE PROVIDED: Yes. The Homeowner’s Association mows and cares for the lawn. LIVING AREA SIZE & ROOMS: The Living Room has a Brick Corner Wood Burning Fireplace. It is L-shaped with the Dining Room. This area has a Vaulted Ceiling. There is a Window Box in the Living Room. There is a Garden Window in the Kitchen. The Townhouse is about 1008 Heated and Cooled Square Feet. KITCHEN APPLIANCES: Range, Refrigerator with ice-maker, Dishwasher, Disposal and Microwave. LAUNDRY APPLIANCES: Washer and Dryer. There is an Inside Laundry. SECURITY DEPOSIT: $895.00 . This is not the last month’s rent. TERM: Lease to end July, 2016. PARKING: Two Assigned Parking Spots. PETS: Pets under 30 lbs. may be considered. Dogs must be 30 pounds or less. There is a Pet Application and Interview with the Pet. Pet Fee varies with the Pet ($250.00 per Pet). This is Non-refundable. With pets, the tenant must have a Tenant’s or Renter's insurance policy addressing Pet Liability. AMENITIES: There is tile in the Dining Room, Kitchen, Hall & Baths. Carpet is in the Living Room & Two Bedrooms. There is a Covered Back Porch with an Outside Storage Room. This Unit is in Excellent Condition!